Want to learn how to turn your own sewing patterns into digital files to print full-sized on high quality paper? 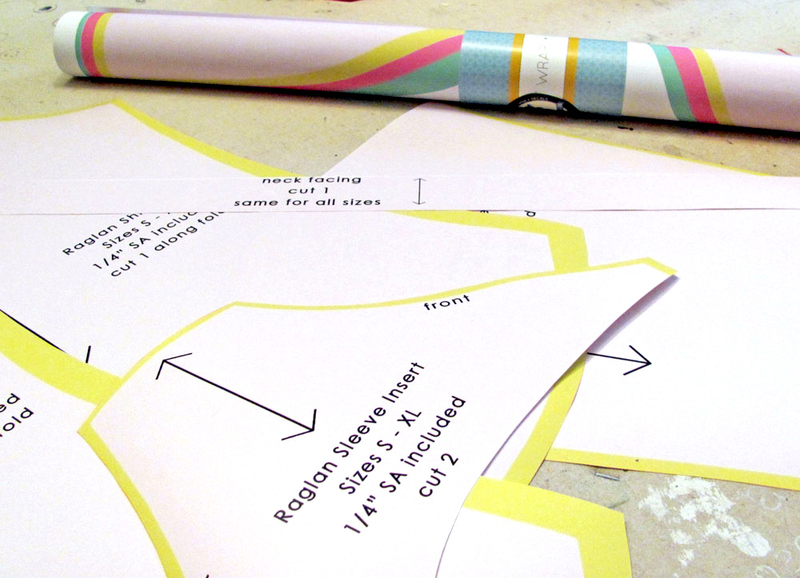 Today, independent clothing designer and Spoonflower team member Jamie Powell visits the blog to show you how to take your own hand-drafted patterns and create digital files to print on a roll of inexpensive gift wrap either for your own garment making or to sell your pattern designs. 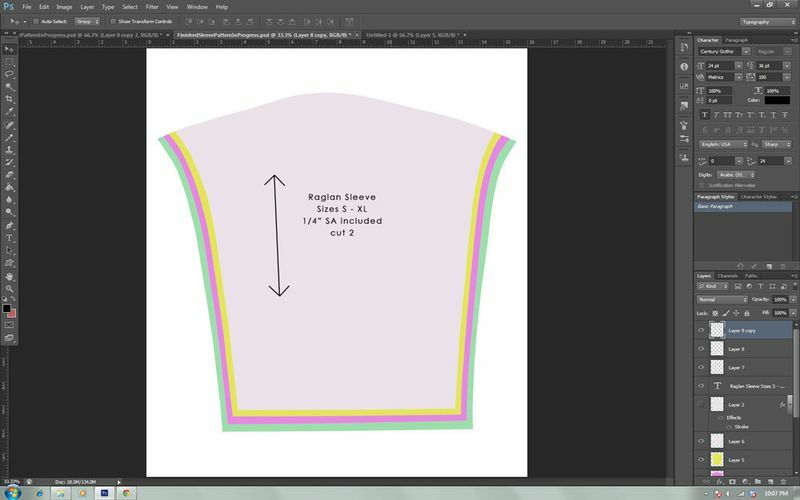 This tutorial will walk you through the process of turning your hand drawn sewing pattern into a digital file using Photoshop. Some basic knowledge of Photoshop is helpful, but there are only a handful of tools that are used in this tutorial, so you don’t need to be an expert. The example I use is a raglan sleeve shirt pattern that I’ve been interested in offering for sale. Digitizing your patterns is a great way to get them clean and professional looking, and even if you’re not trying to turn your projects into profits, it’s a great way to preserve your patterns and make them easy to share with friends. 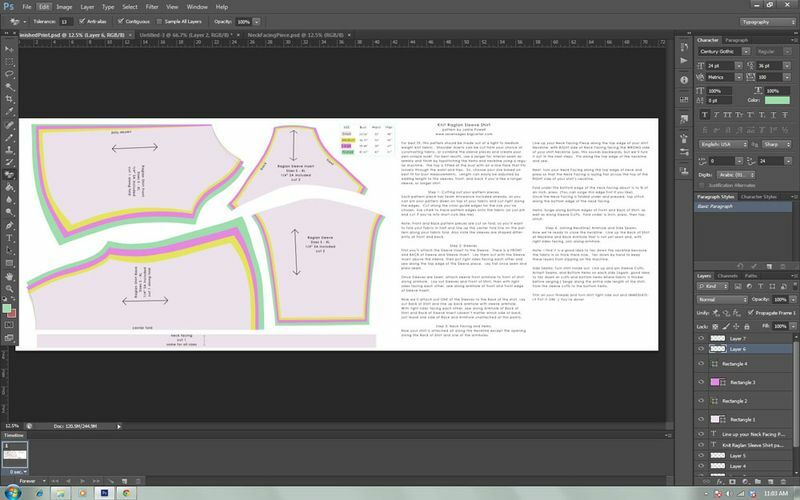 The first step in getting your pattern digitized is to scan your pattern pieces so that they can be edited in Photoshop. If your pattern pieces are large, you will need to cut them into pieces small enough to fit on your scanner bed. 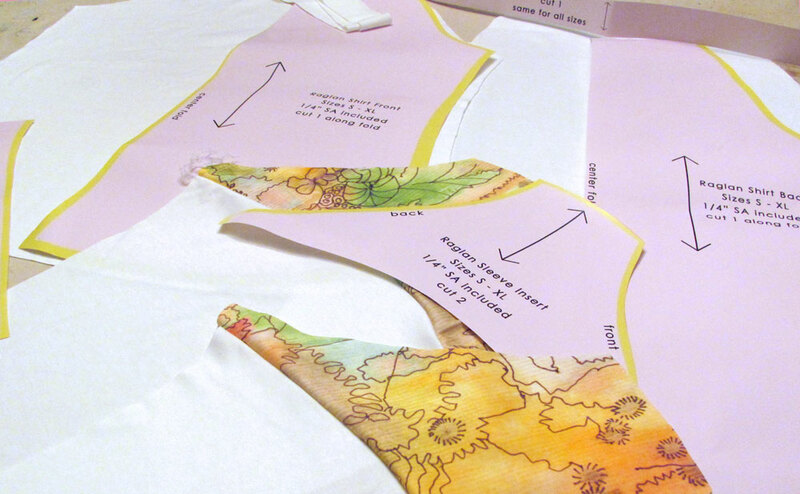 I’m scanning a raglan sleeve shirt pattern that shows sizes S – XL and in order to fit everything onto an 8 ½” x 11” scanner bed, the 4 separate pattern pieces had to be cut up into about 18 pieces. 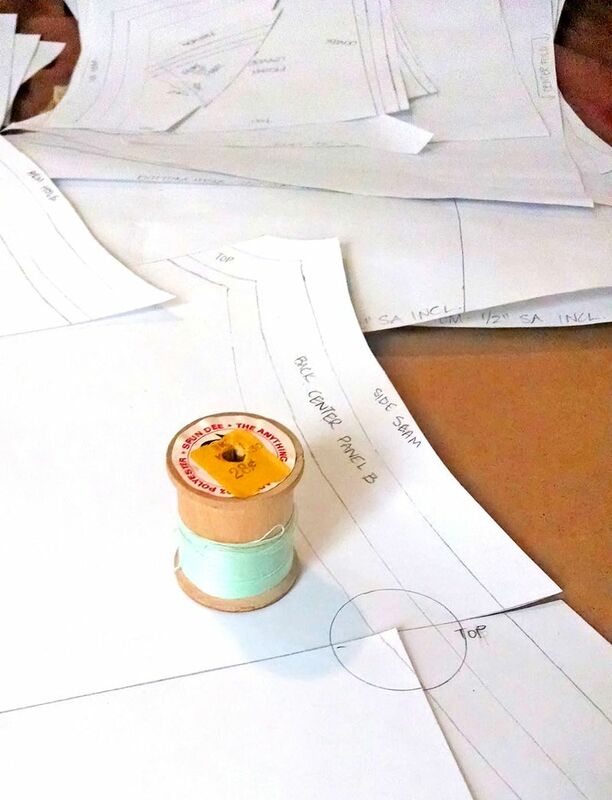 For a complex pattern like this, I advise using a small symmetrical image centered over your cutting lines – this will make it easier to reassemble your pattern pieces later. Scan your pattern pieces and save the images as .jpg files. The resolution of your images is important. I’m planning to print my pattern at Spoonflower where I know that images will be printed at 150 dpi, so I want to make sure that the scanned images I’m working with are scanned at 150 dpi so that they print out their actual size. If you can choose your resolution when you scan, then choose the resolution you want to print your pattern at. If you don’t have this option when scanning, then you can change the resolution once you’ve opened your file in Photoshop by going to the Image menu and choosing Image Size. Enter your desired resolution – this will change the resolution without changing the dimensions of the image. 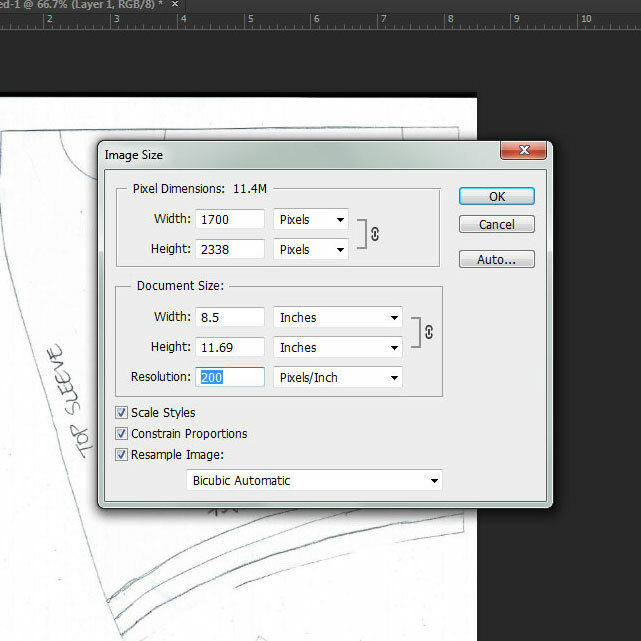 Once all your pattern pieces are scanned, you’re going to open the .jpg files in Photoshop and put them back together. 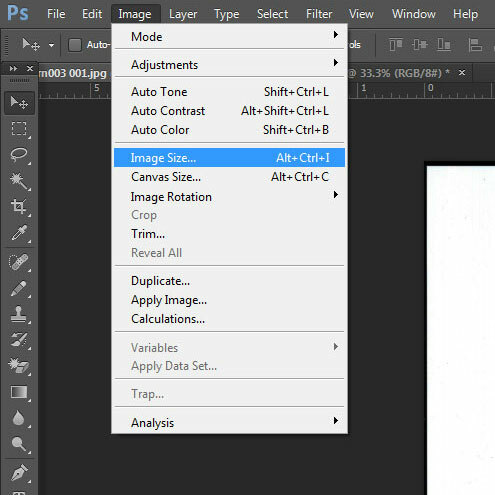 Create a new file in Photoshop by going to the File Menu and selecting New. Enter the size dimensions of your new file to be large enough to fit your reassembled pattern piece at your desired print resolution. Using my pattern’s sleeve as an example, the largest size sleeve is about 15” wide x 18” tall. I made a new canvas that was 16 inches by 20 inches to make sure my reassembled sleeve would completely fit. Choose the first scanned pattern piece you’re going to work with. First, use the Rectangular Marquee Tool from the toolbar running down the left side of the screen (you can also hover over each icon on the toolbar for a moment to make the name of each tool appear). Starting at any corner, use this tool to draw a box around your pattern piece. Next, copy your selection (right click and select copy or Ctrl+C), then paste the selection onto your New blank file, which will create a new Layer. 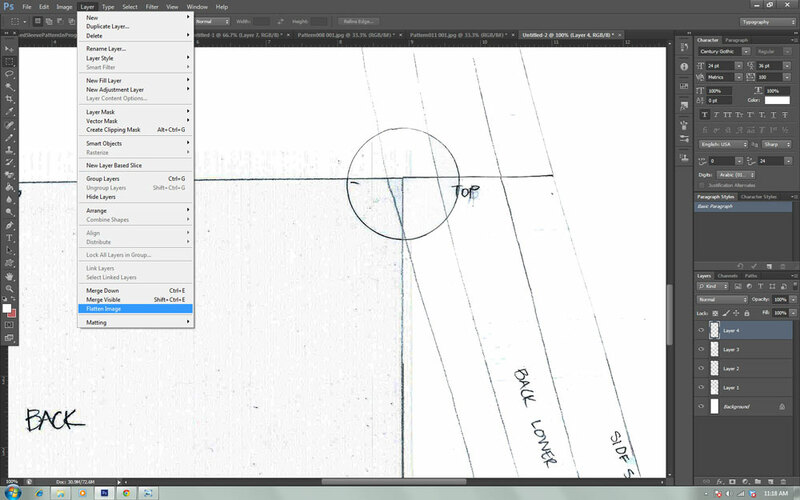 With the marquee tool still selected, right click inside your pattern piece and choose Free Transform. You can now rotate and drag your pattern piece into place. Repeated the select, copy, and paste steps with each pattern piece until your pattern piece is reassembled on the new canvas. You will need to use the Magic Eraser Tool if you are assembling multiple pieces to erase the white background of each scanned pattern piece. 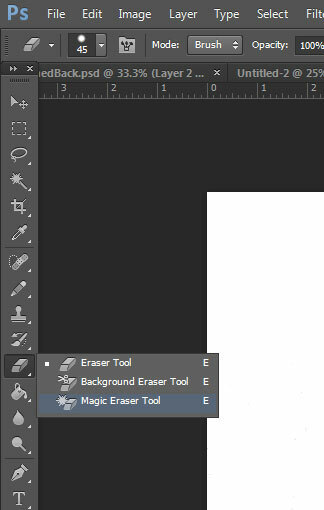 From the toolbar on the left, choose the Eraser tool and click on the tiny arrow at the bottom corner of the icon which will give you more Eraser options. Click on the Magic Eraser option. Click anywhere on the blank area of your scanned pattern piece and it will remove everything matching that color, making the background transparent and leaving only your black lines behind. 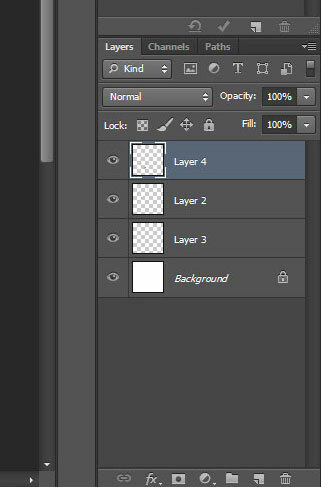 (Note: whichever Layer is highlighted on the Layers menu in the bottom right of your screen is the layer you are editing). Sometimes the scanned images will be hard to see when you open them in Photoshop. You can increase the Contrast and decrease the Brightness on each pattern piece layer to make your hand drawn lines easier to see and line up. Under the Image Menu, choose Adjustments, then Brightness and Contrast. The Levels tool under the same menu will produce similar effects. Once the pattern pieces are fully reassembled, you can get rid of all the layers by going to the Layer menu, then choosing Flatten Image. 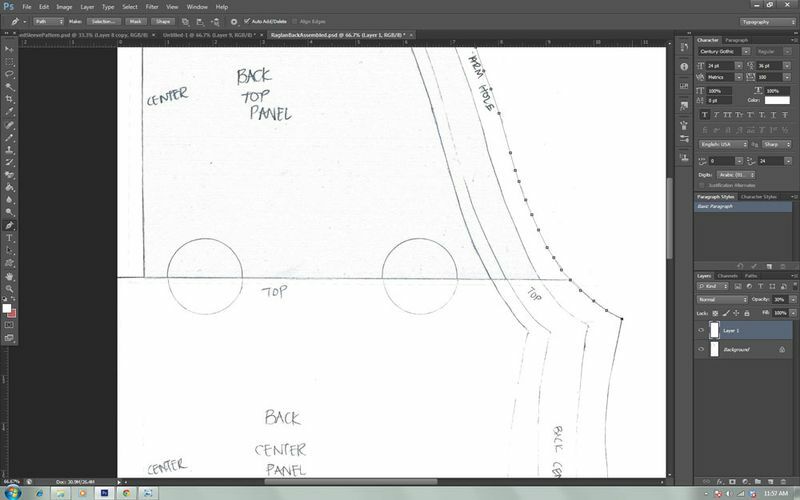 The next step will be to trace your reassembled pattern piece with the Pen Tool to get rid of all the hand drawn cutting lines and messiness. On your now reassembled pattern file, create a New Layer and then select the Paint Bucket tool from your toolbar on the left. Click anywhere on your canvas with the paint bucket to fill in the layer – I used a white fill layer but you can use whatever color will give you a good contrast against the hand drawn pattern lines. 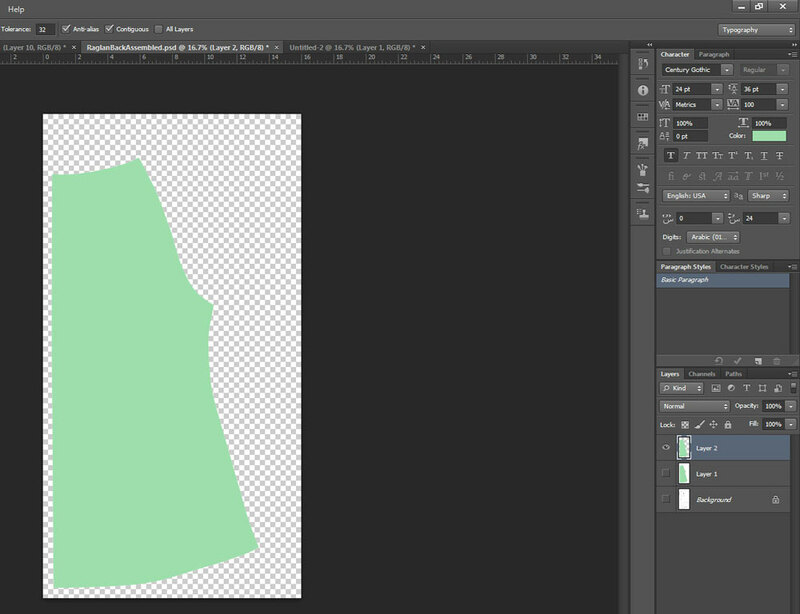 This new filled in layer should be on top of your pattern piece layer, hiding it from your view for the moment. Now, lower the opacity of your new layer down to about 30%, so that you can see the lines of your pattern piece through your new layer. 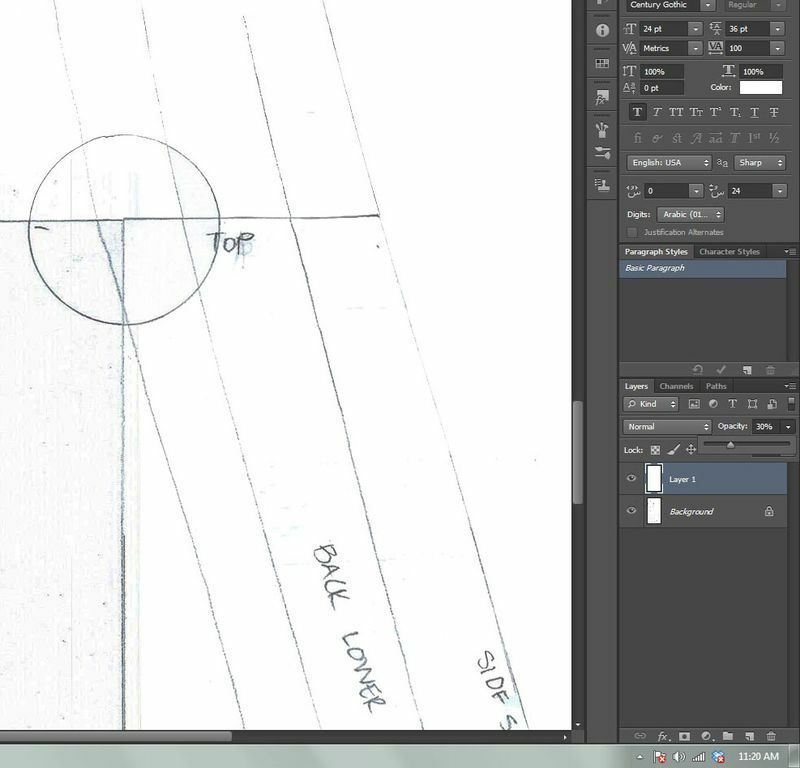 With your New Layer selected, choose the Pen Tool from the toolbar on the left. Click along the outline of your pattern. Each spot you click will connect to the spot before it, until you have come back to your starting point and enclose your pattern shape. Trace until you get back to your starting point – a small circle will appear just before you connect back to your first point, and all your individual dots will disappear once you’ve connected back to that point. Next, right-click inside your enclosed dotted line and choose Make Selection from the pop up menu. The outline will start sort of blinking. Now, using the Paint Bucket tool again, fill in your pattern piece with a different color (I chose a set of pastel colors just for fun). This will fill in your selection. Now you can hide your hand drawn layer by clicking the little eye icon next to it you see only your finished piece. Since I have four sizes shown on each pattern piece, I repeated the steps above, creating a new layer and tracing around the outer limit of each pattern size line, and filling in each layer with a different color. When I stack them all on top of each other, each size is clearly shown in a different color making it easy for the final user to cut out the size they want and get to sewing! 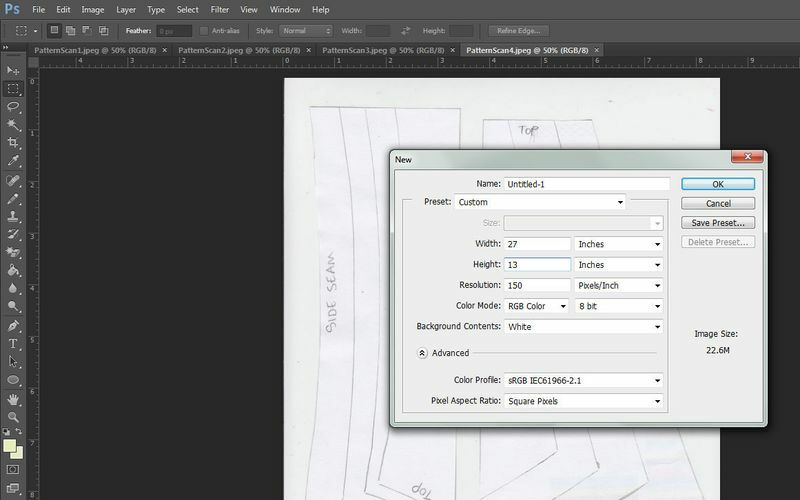 You can now add a text layer to your finished pattern piece providing all the important information using the Text Tool from the toolbar on the left. You can also use the pencil tool to draw an arrow showing the grainline. The Pencil tool is also found on the toolbar. Choose the weight in pixels for your line, and you can make a perfectly straight line by holding down the Shift key as you draw your line across the screen. Once your line is drawn, use the Free Transform tool we used earlier if you need to adjust the direction/orientation of your line. Whatever your plans for digitizing your hand drawn patterns, this finished product is sure to save you time down the road. You can easily copy patterns to share with your friends or for a class, or you can offer your patterns for sale either as a print or digital download. I’ve added my raglan pattern to the marketplace on Spoonflower, and I’ve also linked it from my website, Seven Sages, where I have the completed shirt available for sale as well. 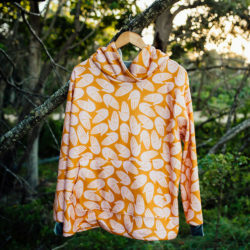 (Check out my tutorial for how to sew your own soft and stretchy jersey raglan using this pattern too.) Once your pattern is digital, the sky’s the limit! See what fun, new applications you can discover for your own digitized patterns! 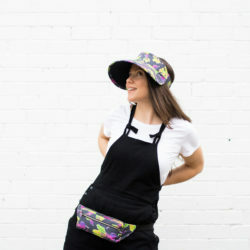 In addition to being part of the Spoonflower team, Jamie designs a clothing line, Seven Sages, that produces limited edition runs of women’s clothing with a mission to deliver high quality garments with low environmental impact. When she’s not busy working at Spoonflower and sewing, Jamie enjoys being a thrift store addict, a dog lover, and a pretty good cook. This is wonderful! Exactly what I was looking for as I have been considering/wondering how to turn my freezer paper hand-drawn patterns into digital pdf’s. Thank you so much for this tutorial! The timing could not be more perfect! 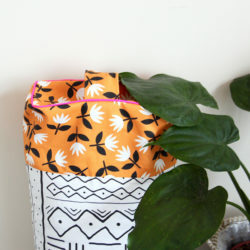 If you made each pattern to have it’s own one size, you could take a pattern from Spoonflower and “drop it in. Then a person just picks the pattern size, the material print, and has Spoonflower print it all. That would save so much time. Also, now that there is a jersy knit fabric at Spoonflower, the exact size doesn’t need to be all that exact. What a great tutorial. I create a lot of patterns but have never considered selling any because I wasn’t sure how to frugally create a professional looking pattern. Thank you so much for taking the time to share this tutorial. Nice article, but only if you have photoshop and a large size printer. GIMP is an open-source (free) program that is similar to Photoshop. You don’t need a large size printer if you can get a print shop to print it out, and you won’t need to do that very often. You will however, need a scanner. Fortunately they are low cost, especially second hand. Another way is using a vector program like Inkscape combined with laying your pattern out on a large grid, and calculating the co-ordinates of the pattern and entering them into the vector program. May not be quite as accurate unless you are careful or the pattern is quite simple. The advantage of this is boom, instant vector version of pattern, very clean and smooth looking, which can be further manipulated or tiled for a PDF printout. Inkscape will also take a scanned bitmap of your pattern and turn it into a vector outline, I believe. We specialize for fast, reliable, high quality Custom Digitizing, Digitizing Embroidery and Embroidery Digitizing Service. Wow, awesome tutorial. I have Photoshop CS 5 for Mac and will be trying this soon. Thank you. I am a guy with no experience with seving at all but I am still a textile printer who wants to create such items as http://i.imgur.com/1tOdHVY.jpg?1 (This first coat was created from a paper pattern). I just learned what people call a “pdf digital pattern” and its still pretty useless to me due to the tiling and unclean lines. Could you please point me to a source where I could get sewing patterns a) in original size pdf b) sizes with clean vector lines and no tiny rectangles instead? My workflow would be to include the images into the patterns, print, het transfer, cut sew, sell. I know this is going to sound crazy, but what do you expect from a man who does not saw. Is there a machine that will allow you to import already made clothing patterns, then cut those patters and then saw the pattern together to have a finished product? Glad you liked it, Fred! 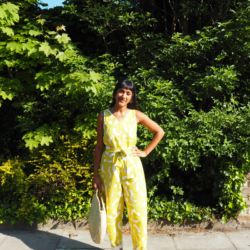 Pattern making is always a challenge – glad you enjoyed this tutorial! Thanks so much for the kind words, Lesley! Awesome! Let us know how it goes for you! Very informative idea you shared with us , it really help me in embroidery because i am just a beginner in digitizing embroidery . I have a question about the scanning. When you scan is\’nt there a small ammount that does not get scanned arojnd the edge of the scan plate? How do you account for that? Glad you enjoyed it, Mark! Thanks so much for reading. you just tweeted out this article from 2014, and it’s now end of 2016…and I’m going to be the voice of dissent. I get that I’m a trained, educated designer, and not everyone has ~20 years in that field…but this is not really sound advice, IMO. 1. PhotoShop is a LARGE software platform. It is, let’s say for simple terms, a pixel software – it’s for photos. Not lines, aka vectors. Why in the world would someone go through the expense and time to learn this software, when it’s not the right software for a project based on lines? Let alone, most people when they start with photos have no idea about resolution and leave it at the default 72 DPI (dots per inch) which is old screen resolution, NOT print resolution – think blurry fuzzy images, and like a sweater, once you shrink it, you can’t make it bigger…I could go on and on why this is such a very bad idea. 2. Of the Adobe software, Illustrator is the vector, or line-based, software. It IS the one of this suite you would want. Illustrator is also a very large-in-scope platform, and isn’t something easily fumbled through. 4. AutoCAD would be extreme overkill, but would also work. Corel and AutoCAD have really great options for scaling. Illustrator not so much, but Illustrator is the industry standard for vector design. There are people who are reasonably priced who will do this for you as well – no learning and investment or hair-pulling-out required. There’s a reason why the contestants on Project Runway are designers, not always great sewists…. design and math don’t have to converge for you to be successful. You don’t have to do it all. I can do both…but, again, this has been decades of work…I couldn’t turn around and be a lawyer tomorrow. That would be decades of work…. If one wants to do this, by all means, have at it. I know lots of designers that have taken classes at the local design academy, etc. and they’re doing it themselves in AI. I personally love indie designers, but shy away from the overly “homemade” looking patterns like the one above, especially for a woman’s pattern – there’s no way the grading is going to be accurate. If you’re just making kids’ garments…eh, they’re tubes. They’re pretty easy anyway, and maybe you won’t get too many complaints? But that dang armscye… you know that’s going to need to be tested and retested…at which point, you could have just had it done correctly. In my line of work, a designer using PhotoShop for everything is obviously a n00b and not very good. sorrynotsorry. Maybe think – how far are you really wanting to go with this? How professional or crafty do you want to be? I’m not criticizing the hobbyist by any means, I’m trying to give you the ability to make a FULLY informed decision here. As was pointed out earlier, Inkscape (https://www.inkscape.org) is free, open-source software that will run on your Mac or Win computer and it is vector-based. The learning curve is not much different from AI. I like the idea of one of the readers to superimpose a measured grid, say 1″ x 1″ and use that as a guide to scale your pattern up or down as indicated. The assumption, of course, is that the relative proportions (e.g. bust, waist, hips) remain constant. They generally may vary with the woman. Do the measurements. Your mileage may vary. beckyjopdx is right in that Photoshop is a rather large hammer for the problem. 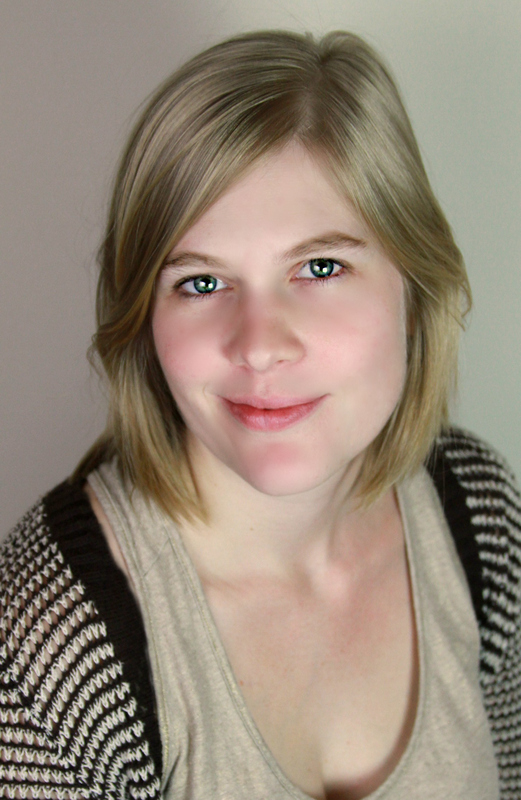 Photoshop Elements is a stripped-down version of the program and much less expensive. For grins, you might check out garment design software from Wild Ginger (www.wildginger.com) for basic design software with some very nice features all the way through professional design and production software. They also offer other services and pre-made patterns that might interest you. For that matter, if you plan to produce lots of copies of patterns, you might do well to buy your own wide-format printer. I’ve seen 42-inch printers on eBay for less than $1,000. Selling 60 patterns or so will bring in about enough to pay for the printer and consumables. So, the bottom line is this is pretty doable and you don’t have to spend the National Debt to do it.